Petro-Bosses’ Privatization Means Workers’ Blood! The 40-story Brazilian oil platform was the world's largest when it went into production last year. But despite the most advanced technology, the bosses’ drive to increase profits made the rig a death trap. The P-36 platform was destroyed by three explosions on March 15, with a toll that rose over subsequent days to eleven workers thrown into the ocean’s depths or burned to death. The oil rig belonged to the state-owned Petrobrás (Brazil Oil) company, whose frenetic privatization drive has meant mass layoffs and an all-round assault on workers’ health and safety. The platform, located 80 miles from the Brazilian coast and 120 miles northeast of Rio de Janeiro, processed 80,000 barrels a day and was scheduled to produce 180,000 a day by 2003. As Petrobrás profits have reached unprecedented levels in recent years, so has the number of workers killed and maimed. While the images of the P-36 platform sinking into the sea were broadcast around the world, company management scrambled to reassure investors that workers’ deaths will not stand in the way of the drive to fully “open” the sector to private capital. 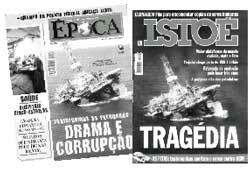 Following the disaster, the FUP oil workers union discovered that on the day of the explosions Petrobrás deleted three days’ worth of bulletins from the company’s internal “intranet” site. It was also revealed that the company had built a drainage tank for oil and drilling by-products in the column that exploded on March 15. The deleted company bulletins, obtained by the union and divulged to the Brazilian press, revealed that management knew there was a major flaw in the rig’s gas escape system but did nothing about it. Among them was a March 12 message from the P-36 supervisor: “Pressure is building in the platform’s vent system. The probable cause is blockage of the flame damper. It will be necessary to stop production in order to replace it, since it is quite close to the flare tower’s gas burners” (Jornal do Brasil, 23 March). Three days later the rig blew up. The union bureaucracy, linked to the reformist Partido dos Trabalhadores (PT, the Workers Party of Luiz Inácio Lula da Silva), called some protests and a symbolic one-day oil workers strike. But while providing an escape valve for workers’ discontent, it seeks to block the urgently needed class-struggle fight against the Petrobrás criminals and the regime of president Fernando Henrique Cardoso. The following leaflet is translated from a bulletin of the Comitê de Luta Classista (the Class Struggle Caucus, led by our comrades of the Liga Quarta-Internacionalista do Brasil) distributed to a March 22 protest at the Petrobrás headquarters in downtown Rio de Janeiro. Organize a strike of all oil workers, occupy the plants and facilities to impose workers health and safety committees with the power to shut down production! For a 24-hour nation-wide strike to protest the continuing murder of Petrobrás workers! RIO DE JANEIRO, MARCH 20 – The bodies of nine workers have finally sunk to the bottom of the sea, Petrobrás management says. With them went P-36, the world’s largest oil platform, which the company values at approximately one billion reals (US$500 million). The tragedy began in the dark of night on March 15, with explosions that irremediably damaged the platform and claimed the lives of the workers, as well as leaving many wounded. In the course of only three years, from 1998 to March 2001, some 82 workers have died, most of them employees of subcontractors working in precarious conditions for firms with shady and corrupt links to Petrobrás management, which in its quest for profits has driven production records ever upwards at a breakneck pace. As fatal accidents multiply, so has the daily tension and toll on the workers, who are increasingly exhausted, subjected to grueling, absurd 12-hour days. For the workers’ families, grief and mourning are always on the horizon. Under Cardoso, Petrobrás has cut the number of workers from 70,000 to 33,000. The death rate has reached an average of three workers killed every 37 days. The company carries out no risk analysis of dangerous jobs, while making ever-deeper cuts in funds devoted to improving working conditions. Yet it recently invested US$350 million on the quest to change its name from Petrobrás to Petrobrax – that is, changing the s to an x [thus removing the reference to Brazil] to make it more appetizing to the imperialists. This is one of the many faces of Cardoso, the bourgeois “social democrat” known as a leader of the “third way” of post-modern capitalist “competitiveness.” In this context, the latest accident in a long series of Petrobrás disasters, including oil spills with a huge environmental impact, has left strong suspicions of sabotage floating in the air. It is one more drop in the ocean of corruption and servility engulfing Cardoso, who faces a growing crisis. In 1991, when U.S. imperialism, in its drive to control the world’s petroleum, took the lead in raining death on the people of Iraq – with missiles, bombs and a starvation embargo that continues to this day – Cardoso backed the imperialists. When the imperialists launched a new attack in 1998, we of the Liga Quarta-Internacionalista do Brasil and the Comitê de Luta Classista called for workers action against this attack and in defense of Iraq. Since the restoration of capitalism in the former USSR, the imperialists and the bourgeoisie the world over, including Brazil and its partners in the Mercosur regional trade bloc, have been seeking to destroy every conquest of the workers and oppressed. In the context of growing inter-imperialist rivalries, Cardoso has launched IMF starvation plans; carried out “privatizations” – in reality handing over industries and wealth to Brazilian big business and its partners, the imperialist bankers; attacked public workers; sent the army to smash the oil workers strike, as he did in 1995; unleashed the police, armed fist of the bosses, against the longshoremen in order to destroy their unions and their rights; massacred landless peasants; and carried out mass layoffs in several sectors while heightening racism and every kind of oppression. He does all this in “partnership” with the bourgeoisies of the other Mercosur countries, while preparing to be a docile servant of his imperialist masters’ Free Trade Area of the Americas scheme, which will mean even harsher exploitation for the workers of semi-colonial countries such as Brazil. Fire in the Campos oil field, 1984. Thirty-seven workers died. In order to carry out this dirty work, the aid and direct participation of the reformist leaders of the PT and the CUT labor federation have been indispensable. Subordinating the working people to a class-collaborationist alliance with the bosses, this popular front seeks to suppress any resistance to the capitalist onslaught. Where the PT is in office, it imposes the same anti-working-class attacks as the bosses’ parties. The oil workers’ tragedy urgently shows the need to break with the popular front and forge a new leadership of the workers movement – a revolutionary, class-struggle leadership. Organize a Strike of All Petrobrás Workers! The workers should immediately organize a strike which must also involve subcontractors’ employees, demanding that they have equal rights with Petrobrás workers, combating those who play the bosses’ game by placing the blame for increasing job hazards and insecurity on these contract workers instead of the bosses, who always foster divisions in the working class. Call on other labor sectors which are currently organizing unified campaigns to join in; extend the call to women workers and workers’ wives, who are once again showing their combativity as they participate in demonstrations to demand their companions’ rights. The Comitê de Luta Classista calls for electing a strike committee and creating workers committees (without management) to fight the terrible health and working conditions and which will have the power to shut down unsafe work. The CIPA committees (Internal Commissions for the Prevention of Accidents) are made up of representatives of both the workers and the bosses; they are not only impotent but instruments of class collaboration. The struggle for class independence must be carried out on the shop floor as well, taking a stand against any participation by the bosses. This step is fundamental in the fight for workers control of factories, businesses and workplaces.